Romeo has a home! - Rocky Mountain Great Dane Rescue, Inc.
Romeo has a home with his foster family in Butte, MT. 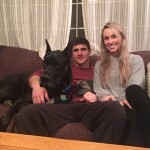 Jessie has grown up with with Giant Breed dogs and now her and her fiancé wanted to make the next step in rescuing a Great Dane. Romeo immediately fit in perfectly into their home and can’t imagine him anywhere else. This amazing family has been through a lot with Romeo and his TPLO surgery on his one leg and are 100% committed to his life and health!…. Congratulations Romeo!